I had the tremendous honor of being asked by my old friend Andy and his fiancee Suzette to photograph their wedding. And while weddings are not usually up my alley, it's easy to say yes when you know and love the couple! I met up with Andy and Suzette over beers in Corvallis back in the fall to talk the wedding over with them, and I immediately knew it would be a fun shoot. 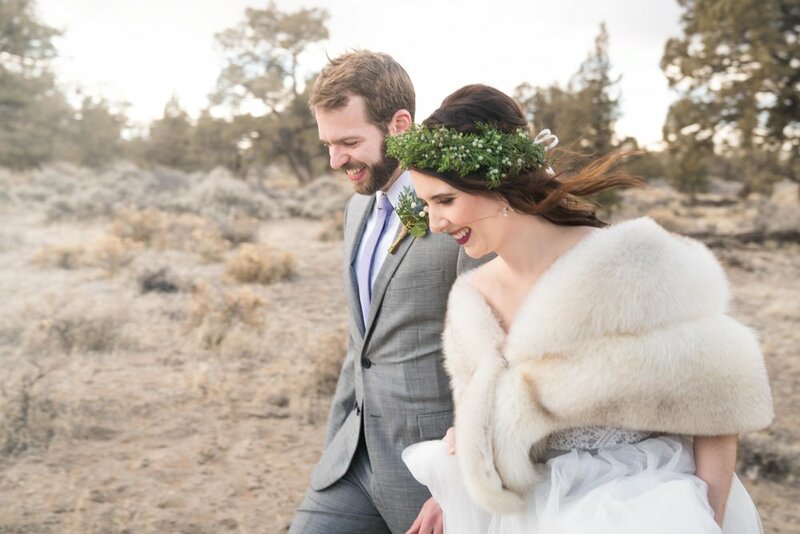 They were hosting the day at the Pronghorn Resort, just east of Bend, Oregon - the resort is in the High Desert, surrounded by juniper and sagebrush and Andy and Suzette wanted the desert environment to feature prominently in their wedding photos. Plus, they were kicking off the weekend with a reception at the Deschutes Brewery tasting room. I'll be honest, I was a little nervous about shooting the wedding when the big morning came. After all, I'm more used to working with a couple athletes at a time than groups of 50+ people in formal wear. I showed up to the Pronghorn two hours early - only to spend the ensuing time until the bridesmaids and groomsmen were ready for some informal photos checking and rechecking my camera gear and re-scouting locations I had already checked out the day before. But once things picked up, the day flew by and I had a blast working with the wedding party to put together some fun images - the guys in particular were ready for some unorthodox poses after a couple rounds of scotch while putting on their tuxes. When it came time to take Andy and Suzette out into the sagebrush outside the resort for their photos together, I felt like I was back to being fully in my element - shooting two people against the backdrop of and interacting with the desert. Thanks to storms blowing in from over the Cascades, we ended up with absolutely stunning light even though in reality it was 2 in the afternoon. The flip side was that it was windy - Suzette's hair and dress were blowing hard, although personally I loved the effect this created. Because of the cold gusting at us, though, we only stayed out a short time (tuxes and wedding gowns don't offer much in the way of wind protection!) - but I'll gladly exchange shooting time for the dramatic light we found. I'd like to say a huge thank-you to Andy and Suzette for not only having me join them on their big day, but for also inviting me to capture the moments they're hoping to remember for the rest of their lives. Shooting their wedding was a huge honor, a great learning experience to expand my range as a photographer, and all around a fun day celebrating with a long-time friend.